When President Trump initially responded to the fatal violence at a white-nationalist rally in Charlottesville, Virginia, by condemning the “egregious display of hatred, bigotry, and violence on many sides,” Paul Ryan tweeted, “white supremacy is a scourge,” and called the killing of Heather Heyer an act of terrorism. During a CNN town hall immediately after Trump’s Afghanistan speech on Monday night, viewers got to watch in real time as Ryan tried to signal that he’s strongly opposed to bigotry, yet only somewhat opposed to the president who still has the support of the GOP base. First of all, the president and I spoke on Monday morning about the need for moral clarity, about the need at this very difficult time in our country to have a morally clear message, to absolutely and singularly condemn this repulsive bigotry. He agreed with that. And he did that later that day on Monday. And I thought his speech on Monday was pitch perfect. Then, the next day, I think it was in New York on an infrastructure press conference, in answer to a question, I think he made comments that were much more morally ambiguous, much more confusing. And I do think he could have done better. I think he needed to do better. I actually think what he did two days ago in commending the peaceful protests against the hate in Boston was a good start. And I think just what I heard, I don’t know, 25 minutes ago, was exactly what a president needs to say and what we needed to hear. So I do believe that he messed up in his comments on Tuesday, when it — it — it sounded like a moral equivocation, or at the very least moral ambiguity, when we need extreme moral clarity. You’re not a good person if you’re there. That’s just so very clear. So I totally agree with that. And that’s why I think, yeah, it’s — it was — it was not only morally ambiguous, it was — it was equivocating. And that was wrong. That’s why I think it was very, very important that he — that he — he has since then cleared that up. And I think it was important that he did that tonight. 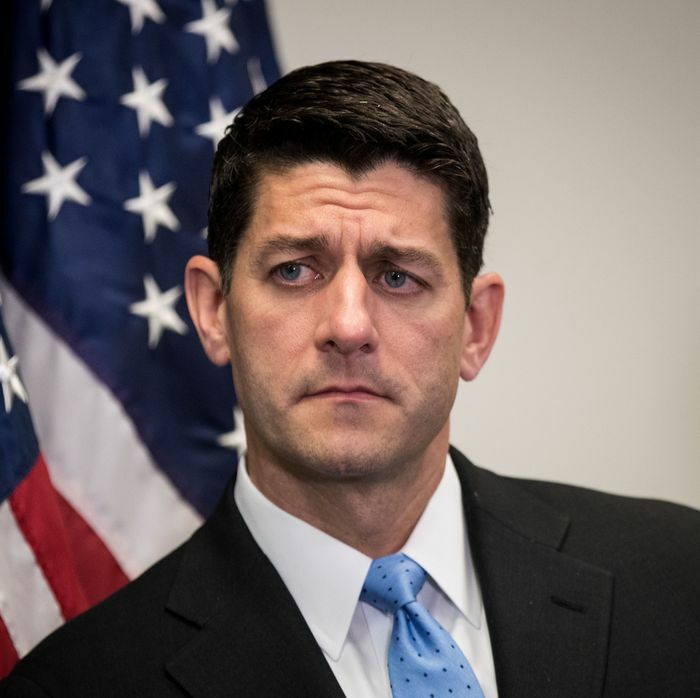 When asked if he thinks Trump’s done enough to atone, Ryan replied: “I don’t think any of us have done enough.” Then in the very next question he explained why he will not be doing anything to hold Trump accountable. Rabbi Dena Feingold, a family friend of Ryan’s, asked him whether he would support the resolution before Congress to formally censure Trump for his Charlottesville remarks. It is very, very important that we not make this a partisan food fight. It is very important that we unify in condemning this kind of violence, in condemning this kind of hatred. And to make this us against them, Republicans against Democrats, pro-Trump, anti-Trump, that is a big mistake for our country, and that will demean the value of this important issue. Censuring Trump doesn’t need to be a “partisan” fight, but Ryan seems to assume that when forced to choose between defending Trump and making a strong symbolic stand against bigotry, Republican lawmakers will go with Trump. It’s lucky for Ryan that Trump got it right on his fifth try. Ryan is extremely passionate about coming together to denounce white supremacy, unless it involves doing anything that could further strain his relationship with President Trump.